Ichthyology (from ichthyo before a consonant and ichthy before a vowel, deriving from the Greek ixthu, combining form of ixthus, meaning "fish") is the branch of zoology devoted to the study of fish. This includes bony fish (class Osteichthyes, with over 26,000 species), cartilaginous fish (class Chondrichthyes, about 800 species including sharks and rays), and jawless fish (class or superclass Agnatha, about 75 species including lampreys and hagfish). The study of fish, which is centuries old, reveals humanity's strong and lasting curiosity about nature, with fish providing both inner joy (beauty, recreation, wonder, and religious symbolism) and practical values (ecology, food, and commerce). With about 27,000 known living species, fish are the most diverse group of vertebrates, with more than one-half of the total vertebrate species. While a majority of species have probably been discovered and described, approximately 250 new species are officially described by science each year. Hagfish, while generally classified in Agnatha and as fish, actually lack vertebrae, and for this reason sometimes are not considered to be fish. Nonetheless, they remain a focus of ichthyology. Many types of aquatic animals named "fish," such as jellyfish, starfish, and cuttlefish, are not true fish. They, and marine mammals like whales, dolphins, and pinnipeds (seals and walruses) are not a focus of ichthyology. The practice of ichthyology is associated with aquatic biology, limnology, oceanography, and aquaculture. Ichthyology originated near the beginning of the Upper Paleolithic period, about forty thousand years ago, and continues to the present day. This science was developed in several interconnecting epochs, each with various significant advancements. According to K.F. Lagler et al., the study of fishes (ichthyology) was hardly scientific until the eighteenth century. However, there were attempts to study fish, if only to learn how to propagate them for aquaculture, to capture them by fishing, or to adhere to dietary laws. 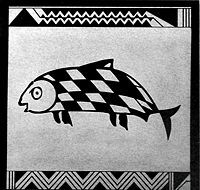 Fish compose approximately 8% of all figurative depictions on Mimbres pottery. The study of fish likely receives its origins from the human desire to feed, clothe, and equip themselves with useful implements. Early ichthyologists were likely hunters and gatherers who investigated which fish were edible, where they could be found, and how to best capture them. These insights of early cultures were manifested in abstract and identifiable artistic expressions. Around 3,500 B.C.E. the Chinese were trying to learn about fish in order to practice aquaculture. When the waters lowered after river floods, some fishes, namely carp, were held in artificial lakes. Their brood were later fed using nymphs and feces from silkworms used for silk production. There is evidence of Egyptian aquaculture, focusing on tilapia, tracing to 2000 B.C.E. Moses, in the development of the kashrut (Jewish dietary laws), forbade the consumption of fish without scales or appendages. This required some study of fish that has continued to this day. The oldest known document on fish culture was written by a Chinese politician, Fan-Li, in 475 B.C.E. (Parker, 1995). Aristotle incorporated ichthyology into formal scientific study. Between 335 B.C.E. and 322 B.C.E., he provided the earliest taxonomic classification of fish, in which 117 species of Mediterranean fish were accurately described. Furthermore, Aristotle observed the anatomical and behavioral differences between fish and marine mammals. After his death, some of Aristotle's pupils continued his ichthyological research. Theophrastus, for example, composed a treatise on amphibious fishes. The Romans, although less devoted to the pursuit of science than the Greeks, wrote extensively about fish. Pliny the Elder, a notable Roman naturalist, compiled the ichthyological works of indigenous Greeks, including verifiable and ambiguous peculiarities such as the sawfish and mermaid, respectively. During this time, the study of fish was also pursued in less systematic ways, either for fishing or aquaculture. Roman aquaculture was practiced in the first century B.C.E., according to Pliny the Elder (Parker, 1995). The Romans focused on trout and mullet and were quite adept at breeding fish in ponds. Theologians and ichthyologists speculate that the apostle Peter and his contemporaries harvested the fish that are today sold in modern industry along the Sea of Galilee, presently known as Lake Kinneret. These fish include cyprinids of the genus Barbus and Mirogrex, cichlids of the genus Sarotherodon, and Mugil cephalus of the family Mugilidae. The Hawaiian people practiced aquaculture by constructing fish ponds, with an organized system in place by 400 C.E. A remarkable example from ancient Hawaii is the construction of a fish pond, dating from at least 1,000 years ago, at Alekoko. In Central Europe, there is record of pond fish culture at the end of the eleventh century C.E. In Europe during the Middle Ages, aquaculture became common in monasteries, as fish was scarce and thus expensive. A fourteenth century French monk, Dom Pinchon, may have been the first person to artificially fertilize trout eggs (Parker, 1995). There is also evidence that the Maya had a form of aquaculture, as did the native peoples of North America. The writings of three sixteenth century scholars, Hippolyte Salviani, Pierre Belon, and Guillaume Rondelet, signify the conception of modern ichthyology. The investigations of these individuals were based upon actual research in comparison to ancient recitations. Despite their prominence, Rondelet's De Piscibus Marinum is regarded as the most influential, identifying 244 species of fish. The incremental alterations in navigation and shipbuilding throughout the Renaissance marked the commencement of a new epoch in ichthyology. The Renaissance culminated with the era of exploration and colonization, and upon the cosmopolitan interest in navigation came the specialization in naturalism. Georg Marcgrave of Saxony composed the Naturalis Brasilae in 1648. This document contained a description of one hundred species of fish indigenous to the Brazilian coastline. In 1686 John Ray and Francis Willughby collaboratively published Historia Piscium, a scientific manuscript containing 420 species of fish, 178 of these newly discovered. The fish contained within this informative literature were arranged in a provisional system of classification. The classification used within the Historia Piscium was improved upon by Carolus Linnaeus (1707–1778), the "father of modern taxonomy." His two prime contributions were: (1) to establish conventions for the naming of living organisms using binomial nomenclature (the genus name followed by the species name), and (2) developing a hierarchical system for classification of organisms. Although the system now known as binomial nomenclature was developed by the Bauhin brothers (Gaspard Bauhin and Johann Bauhin) almost two hundred years earlier, Linnaeus was the first to use it consistently, and may be said to have popularized it within the scientific community. Linnaeus's taxonomic approach became the systematic approach to the study of organisms, including fish. It was one of Linnaeus's colleagues, Peter Artedi, who earned the title "father of ichthyology" through his indispensable advancements. Artedi contributed to Linnaeus's refinement of the principles of taxonomy. Furthermore, he recognized five additional orders of fish: Malacopterygii, Acanthopterygii, Branchiostegi, Chondropterygii, and Plagiuri. Artedi developed standard methods for making counts and measurements of anatomical features that are modernly exploited. Another associate of Linnaeus, Albertus Seba, was a prosperous pharmacist from Amsterdam. Seba assembled a cabinet, or collection, of fish. He invited Artedi to utilize this assortment of fish; unfortunately, in 1735, Artedi fell into an Amsterdam canal and drowned at the age of 30. Linnaeus posthumously published Artedi's manuscripts as Ichthyologia, sive Opera Omnia de Piscibus (1738). Linnaeus revised the orders introduced by Artedi, placing significance on pelvic fins. Fish lacking this appendage were placed within the order Apodes; fish containing abdominal, thoracic, or jugular pelvic fins were termed Abdominales, Thoracici, and Jugulares respectively. However, these alterations were not grounded within the evolutionary theory. Therefore, it would take over a century until Charles Darwin would provide the intellectual foundation from which it would be perceived that the degree of similarity in taxonomic features corresponded to phylogenetic relationship. Close to the dawn of the nineteenth century, Marcus Elieser Bloch of Berlin and Georges Cuvier of Paris made an attempt to consolidate the knowledge of ichthyology. Cuvier summarized all of the available information in his monumental Histoire Naturelle des Poissons. This manuscript was published between 1828 and 1849 in a 22 volume series. This documentation contained 4,514 species of fish, 2,311 of these new to science. This piece of literature still remained one of the most ambitious treatises of the modern world. The scientific exploration of the Americas advanced knowledge of the remarkable diversity of fish. Charles Alexandre Lesueur, a student of Cuvier, made a collection of fish dwelling within the Great Lakes and Saint Lawrence River regions. Adventurous individuals such as John James Audubon and Constantine Samuel Rafinesque figure into the faunal documentation of North America. These persons often traveled with one another and composed Ichthyologia Ohiensis in 1820. In addition, Louis Agassiz of Switzerland established his reputation through the study of freshwater fish and organisms and the pioneering of paleoichthyology. Agassiz eventually immigrated to the United States and taught at Harvard University in 1846. Albert Günther published his Catalogue of the Fishes of the British Museum between 1859 and 1870, describing over 6,800 species and mentioning another 1,700. Generally considered one of the most influential ichthyologists, David Starr Jordan wrote 650 articles and books on the subject as well as serving as president of Indiana University and Stanford University. Today, ichthyology is a well-known scientific field investigating such areas related to fish as classification, anatomy, evolution, genetics, ecology, physiology, and conservation. Parker, R. Aquaculture Science. Albany, NY: Delmar Publishers. 1995. Coad, Brian. Dictionary of Ichthyology.